(Jan. 31 2019) — The UTSA Office of the Vice President for Research, Economic Development, and Knowledge Enterprise (REDKE) shares its 2018 successes in its first year with the amalgamation of the Research office with the Institute of Economic Development (IED). Focused on UTSA’s mission to drive San Antonio’s knowledge economy, it was a record breaking year for the IED and one of steady growth and expansion for the research community. In 2018, the IED served 43,320 existing and aspiring entrepreneurs, generating a total of $2.9 billion in direct economic impact. Of those who received advising, training and business research assistance, over 1,000 businesses were started or experienced significant growth, resulting in the creation or retention of close to 20,000 jobs. Additionally, these businesses generated $291 million in new financing and $35 million in new tax revenue, with new sales, contracts and exports valued at $2.6 billion dollars. Notably, the South-West Texas Border SBDC earned accreditation from America’s SBDC with a special designation for their efforts in assisting small business clients with the commercialization of their STEM-based technology. In August 2018, President Taylor Eighmy launched a Presidential Initiative on Research Excellence. The REDKE office diversified its institutional research portfolio and developed new partnership models with industry and government agencies to create new funding streams. In fiscal year 2017-2018, total research expenditures increased to US $69.7 million in FY 2018, with the university’s restricted research expenditures growing to US $44.2 million in FY 2018. Researchers received a number of million dollar federal grants for cyber and national security, brain health, psychology, small business development, infectious diseases, advanced materials, autism, and student success initiatives. In total, 301 new awards were received in FY2018, worth $54.7 million. Research expenditures are on target to meet NRUF eligibility and Carnegie Research 1 status. One of the largest and most innovative projects was the creation and launch of the National Security Collaboration Center, part of President Eighmy’s strategic vision. While the construction of a new research facility will begin at the Downtown Campus in spring 2020, federal and industry partners began arriving on campus to work with UTSA faculty in the past few months. Housed temporarily on the Main Campus, the NSCC’s first home has expanded the institution’s ability to conduct applied research. Members include industry partners IPSecure, LGS Innovations, CNF Technologies, CyberTexas Foundation, and federal partners Army Research Laboratory (ARL) and the National Security Agency (NSA). Adding to UTSA’s cyber depth, UTSA was designated by the NSA as a National Center of Academic Excellence in Cyber Operations Fundamental (CAE-Cyber Operations) for 2018 through 2023, recognizing UTSA’s ability to thoroughly prepare workforce-ready professionals to protect the nation’s information infrastructure. The College of Business also received a $2 million grant from the Defense Intelligence Agency (DIA) to train the national security/analytics/cyber workforce as part of its Intelligence Community Centers of Academic Excellence Critical Technology Studies Program. “Innovative collaboration with federal and industry partners on research and training is one key component to growing our research expenditures,” said Bernard Arulanandam, UTSA interim vice president of REDKE. The first Research External Advisory Council (REAC), comprised of industry, military, nonprofit, cybersecurity, biosciences, and research leaders, was created to find new ways to expand research funding and partnerships, and raise UTSA’s profile beyond the region. Company representatives include Cisco, Southwest Research Institute, Capital One, BioBridge Global, Security Service Federal Credit Union, USCYPERCOMM, San Antonio Medical Foundation, San Antonio Chamber of Commerce, Santikos Foundation, Texas Biomedical Research Institute, MITRE, and UT Health. 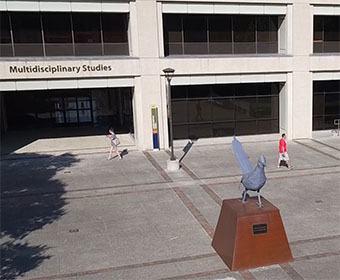 The UTSA Academy of Distinguished Researchers also inducted two new members – Catherine Clinton (History) and Gelu Popescu (Mathematics)– this past year, bringing the total number to 17 faculty researchers. UTSA renewed a research collaboration master agreement with the Cibolo Preserve which allows faculty, staff and students the controlled access to observe, instruct and conduct research. In the last five years, 11 research projects were funded. The Office of Commercialization and Innovation (OCI) expanded its commercialization programs and grew the innovation ecosystem. Two UTSA teams were selected to participate in the NSF’s National I-Corps Program, adding to the ranks of twelve previous UTSA teams over the last three years. In FY 18, OCI managed 51 new technology disclosures, with 67 patents filed. UTSA computer science professor John Quarles was named the 2018 UTSA Innovator of the Year, in recognition of his augmented reality/virtual reality research and innovation. Forty-one (41) UTSA researchers were also recognized for their patents, licenses and I-Corps participation in 2018. Immunologist Bernard Arulanandam was UTSA’s latest inductee to the National Academy of Inventors (2018). He joins UTSA President Taylor Eighmy (2013) and College of Engineering Associate Dean of Research David Akopian (2017). The Office of Research Support (ORS) continued to expand of research support and faculty development activities. In FY18, ORS awarded 33 research grants totaling $495,000 to support research on campus. As of December 1, 2018, UTSA institutional seed grants are open for application and UTSA faculty members are encouraged to apply. The fourth annual SURF conference brought more than 500 researchers from the region to the UTSA campus to share research and build new partnerships, with 137 abstracts submitted, 76 podium presentations and 104 poster presentations. The next SURF conference is slated for June 13-14, 2019. Working with the Office of International Programs, REDKE expanded research opportunities for faculty and students through strategic connections with key international institutions. This past November, Monterrey Institute of Technology and Higher Education (ITESM) launched the first Tec Cybersecurity Hub in Latin America in which UTSA is a partner; others include Citibanamex, IBM, Cisco, Deloitte, and Thales. In November, UTSA met with senior administrators and researchers from the Université Fédérale Toulouse Midi-Pyrénées to explore collaborations and develop strategic research partnerships and programs between the two institutions. These research areas may include cybersecurity, materials sciences, biomedical engineering, mechanical engineering/aerospace, modern languages, communication and history.